Thanks all, for the compliments. I've really enjoyed improving. For me it's very therapeutic. This year, I've been focusing on the human form more, and studying a lot on anatomy. So I haven't been able to dive into it as much as I would like, but I ended up making a new page for my comic. I doubled the DPI which helped with the sketching and inking phase, but as a result switching to Photoshop for the color and text resulted in some adjustments. Typically Manga Studio has a lot of white space since it is designed for print, but for my 8th page I decided to cut most of that out. Even so, I'm a bit uncertain as to the font-size. Granted my monitor is also at a decently high resolution (1920x1080 on I believe a 22inch monitor or so), so a lot of fonts look small. Chances are, I'll be going back to all the previous pages to adjust font and boxes/balloons to keep things a bit more consistent. I also decided to just start doing the backgrounds in "ink" in Manga Studio instead of the "sketch" method I was using to draw them in Photoshop in order to speed up the process a bit. Even so, any and all feedback is appreciated. Here are page 7, which was originally done at 600dpi before resizing and includes the white space for print, followed by page 8, done at 1200dpi and white space cropped out before resizing. Interesting tidbit: because of the complexity of the backgrounds, the last two panel backgrounds took as much or more time to color as it took to sketch, ink, and color everything else. Interesting looking vector drawing program with infinite canvas/zoom. Hey guys. I drew a pokemon. Parasect, I think he is called. Also, pokemon are terrifying. Nice. 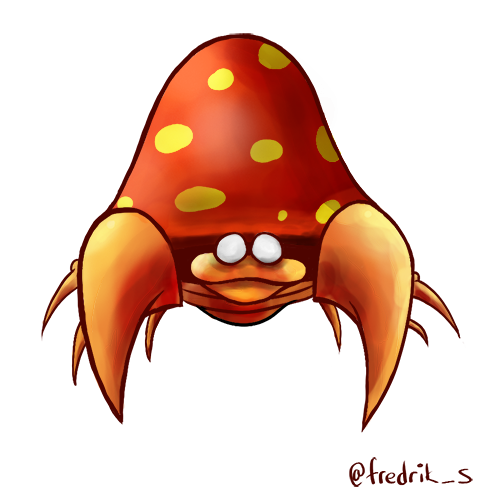 Parasect is indeed the name, and the fungus is the actual Pokemon. The bug body is dead, hence the lack of pupils. Isn't Pokemon a wonderful kid's game? Anyone recommend how to introduce young kids 8-12 to drawing other than the obvious "just do it" style. My nieces and nephews are showing some interest in it this past summer when I enrolled them in YMCA and city programs for drawing but those programs were only for 6 weeks. Are there any paid online or dvd sources that are methodical and worth looking into? It just came naturally to me. I've gone to art schools and I hated the school way of teaching drawing and painting until college, when I could appreciate it for what it was. I'm similar to jlaakso, where I simply grabbed the nearest Nintendo Power or NES/SNES instruction manual and started to imitate the art in there. I tried helping my niece learn a bit, but didn't get to do much with her unfortunately. I really like it because its not like your typical "how to draw" trash that many books seem to be. It actually takes you behind the scenes and shows you anatomy, form, line quality, balance, and other fundamentals that will make their art a bit more versatile. Drawing with the right side of the brain is a classic and is a wonderful teaching aid, but in all honesty, it's pretty dry for a kid to read and learn from. The books by Andrew Loomis are fantastic as well. You can also check out Drawspace which have lessons from absolute beginner to experts. Bonus is that it's free! Oh thank you for the suggestions and keep them coming! I've ordered the books from Amazon and go through them with them in case it gets "dry" and try to figure things out with them. I loved that book when I was a kid. I have one more recommendation, but you may want to hold off until you feel they are ready. Chris Oatley runs a year and a half long class called Magic Box which is about digital painting. It costs $18 / month, but it's amazingly good and a fantastic resource. You study at your own pace, and its all online so there is no pressure except for what you put on yourself. I am currently enrolled (a woefully behind), but it's the beat money I've ever spent on online classes. Don't have a link handy, but google Chris Oatley and his site is the #1 result. Then click the Academy link to read more about it. By Loomis did you mean his Fun with a Pencil? I think his other books might be frustrating for that age group. That is an awesome book. I didn't have it as a kid but it's provided a lot of inspiration in my late teenage years. What feeds drawing is just using your imagination. My main sources have always been games and books. Great source for proportions and some curvature, especially facial stuff. What about the Gnomon stuff? I'm a huge Feng Zhu fan and he used to teach there, but now has his own stuff. Gnomon seems to have a variety of stuff, from painting to 3D modeling and such. $45/DVD is kinda high unless you can keep going back to it for more, that is, it's got depth. Gnomon has a pretty great series from renowned comic artist David Finch. He has other courses on there on comic penciling, drawing dynamic figures, and drawing hands and such. I learned to draw as a kid from Ed Emberley. Quint, he seems to have a bazillion books. Is the one you linked "the best" one or can you recommend another one from him? Don't want to overwhelm them with too many books. Just to reiterate, Drawing from the Right side of the Brain is a GREAT drawing book especially for first time learners. Ordered it, and the video. Looks like a really good suggestion! Thanks! I'll link the ones I owned and used. Quick holiday list of books and items that might be of interest for any artists out there. Unless otherwise noted, these are more geared towards teenagers and adults. This only recently came out, but Scott Robertson has been doing instruction on this topic for a few years now. I find his take on using perspective and draw through to be some of the more practical to grasp out there. You might also be interested in watching him work. The Gnomon library has a DVD on this topic by the author as well. Unfortunately, there is not a book I can reference here. He teaches both in California, and purely online classes via CGMA. You can find a sample of his and other classes available at their youtube channel. But I've found the way he works to be helpful in thinking about drawing the form, and not just the shape. Right off I just want to say some of the big names in figure drawing instruction. Historically you have Loomis, Hogarth, Bridgman, and Peck. More modern instructors might include Michael Hampton and Glenn Vilppu. I cannot say one person who is the best. Some people will have an easier time learning from one instructor than they might in another. However, they all work from the inside out. For me personally, I really enjoy Michael Hampton's book: http://www.amazon.com/Figure-Drawing.... If you are looking for something for a younger audience, give Loomis' Fun with a Pencil a try (http://www.amazon.com/Fun-Pencil-And...). I'm not sure if this exists in the re-print of not, but there were a few pages titled 'fun with races' that fall a bit heavily into uncomfortable stereotypes. This book was originally published in the 1930s, so just be aware of this. If you are not sure shoot me a PM and I'll see if I can show you a copy. Less about definitions and examples, this book explores different methods of creating interesting compositions for your own work and describes what are the different aspects of picture making. This is not really a tutorial, but it does include a series of helpful exercises that will get you to think about composition as being more than simply the objects on the page. You might not know the name of the author, but you may have heard of his book - Framed Ink. This book is set up more like a tutorial. It will show you examples of various ways to compose and the feeling that composition might inject into a piece. Might be of heavy interest to those into sequential art and animation / film. I think this would be fine for middle school and up, but if you aren't sure then check out Parka's review where he does a flip through of the book. The very basics of composition. The information is solid, but it is set up like a picture book. This makes it very simple for even younger readers to follow along with. Kids beyond elementary might snub it for that very reason though. If you are interested in drawing what you see and then using it to create what is in your mind, his books are some of the better instruction out there. Imaginative Realism: rather than taking one topic and going into detail on it, will give you an overview of all the pieces you need for a successful image. Color and Light: discuses different types of lighting, color theory, paint choices, and more all in an easily understandable language. Don't want to learn from a book? The tutorials, both free and paid, available on Ctrl+Paint are great introductions. Gift cards are available if you want to give someone the option of picking out their own topic. The free items are not classes, but serve as introductions and overviews of various topics. The paid classes do go into more depth and show a step by step. I quite liked the peter han tutorials. I've been looking to improve my technique more instead of just copying what I see online. Plus it was funny to see that we used the same exact pen. Loomis' books are back in print (Sometimes under different names then what they were originally published under) and can be downloaded from the internet archive. Though I'm not sure of the legality of those downloads myself which is why I'm not linking to them. I used to gush over Feng Zhu's concept art done with pen and Prismacolor markers. He's since gone digital and upon contacting his assistant I leaned that his old tutorials are unavailable anywhere. I know Massive Black (once "conceptart.org", where I found Feng and Adi Granov) has some stuff but not, that I've ever found, about marker rendering. I asked a couple of times over the last few years in their forums but received no response. Anyone know of a good resource for marker rendering?